Multi-tower configurations allow up to 10 or more CopyWriter DVD towers to be daisy-chained together, allowing the ability to easily make as many copies as needed for even the largest demands! New features include a dynamic 500GB hard drive for disc image storage and DVD recording speeds up to 24X. • DVD-PRM NET-20 is a two-tower configuration daisy-chained together. • DVD-PRM NET-10 is an additional ten-recorder tower which includes cables to connect to other NET-20 or NET-10 systems. Supported Formats Microboards towers support virtually every format. Supported DVD Formats include DVD Video, DVD ROM, DVD+R, DVD-R, DVD-RW, DVD+RW, and Dual Layer DVD. Supported CD Formats include: CD-DA (Red Book) CD-ROM Modes 1&2, XA Forms 1&2, ISO 9660, Photo CD, CD-Extra, Mixed Mode, Video CD, Hybrid CD, HFS. 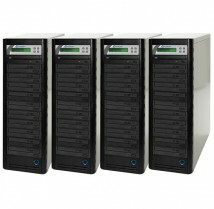 Two-Year Limited Warranty: The standard warranty for Microboards premium and standard towers is the industry's best! Our two year limited warranty easily surpasses the industry-standard single year and includes unlimited phone support. (Two year limited warranty includes controller, enclosure, and power supply. Recorders are covered for one year) Unlimited phone support is included.